The climate action charity 10:10 has launched a campaign to persuade the government that all suitable new buildings should have solar panels fitted as standard. It’s an admirable vision and one that the government and house builders should have been pursuing much earlier. “It’s cheaper and easier to install solar when buildings are being built”, notes 10:10. Of course it is. But such was the silence on this issue that I could only assume that some kind of scarcity ruled out the much larger production of solar panels that fitting them to every new house would entail. Yet this doesn’t seem to be the case. Look back to 2010, and you will find a succession of articles referring to periodic shortages of the component materials, including rare metals used in solar panels in minute quantities, and of silver and aluminium, but nothing to suggest there will be a big downturn in production any time soon. People don’t seem to be retrofitting their roofs with solar panels since the collapse of the feed in tariffs, which is regrettable but understandable. But, given the much lower cost of fitting panels to new roofs, and the big fall in the cost of solar panels since 2010, it’s hard to see why not even a few enlightened builders are doing so as a matter of course. I wrote the following piece in 2014, and it seems just as relevant today. Imagine if you were thinking of buying a new house, and found it didn’t have a shower and wash basins in the bathroom. And they hadn’t bothered to put electricity plugs and light sockets in the spare bedrooms. If you wanted these items you would have to fit them yourself. When you asked the salesman about this skimping on essentials, he said it saved you £3000, so you should be grateful. This wasn’t so far from the state of things as recently as the 1960s. My parents’ home, built in 1959, did not have central heating. It had to be messily added on a few years later, and at considerable cost. Today we expect new homes to be finished with those details throughout. So why are most new homebuyers deprived of an additional, and very useful, feature, a source of free energy that will continue to deliver, with little or no maintenance for many years to come? I think making volume builders fit solar panels to all new homes is such a blindingly obvious, and simple, green initiative by the government that I struggle to fathom why they don’t do it. It’s even more puzzling when you consider those panels could help the UK meet legally-binding Co2 reduction targets. In the village where I live, I’ve noted the outbreak of shiny panels on roofs, from old to newish, over the past four years. They are on former council houses, 19th century cottages, and all sorts of postwar properties. The only place you don’t see panels is on historic, often listed properties. Understandable. And on the roofs of those several hundred brand-new homes built on a brownfield site over the past four years or so. Quite baffling. The builder, I’m sure, will have done whatever building regulations dictate to achieve energy efficiency. There will be double glazing, hot tank lagging, attic insulation and draught proofing. But not a single solar panel, unless the buyers fitted them themselves afterwards. And retrofitting is actually less likely because the last thing new owners want to do is shell out on an add-on to a new house, particularly one they could have had in the first place, after they have arranged the mortgage and started the repayments. 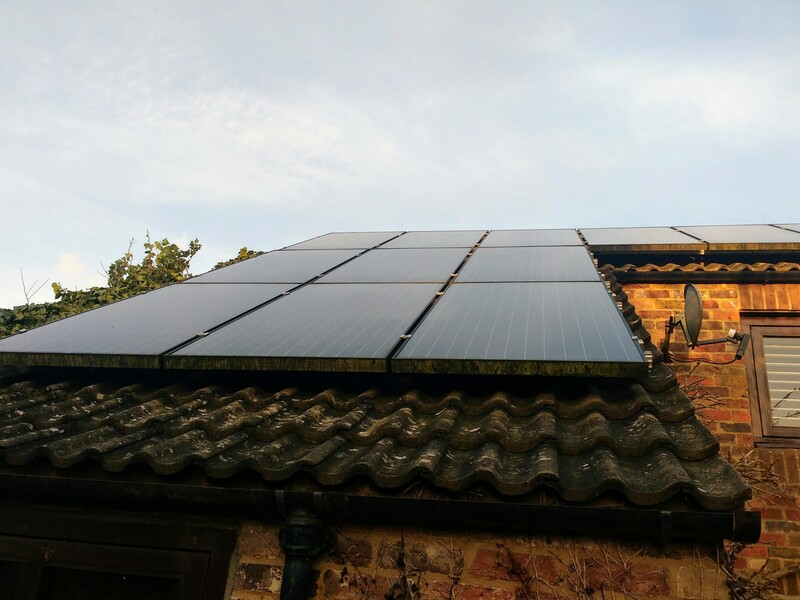 The cost of a solar panel array on your roof can now be as low as £4500, according to BBC 5 Live’s Breakfast business analyst Mickey Clark (Feb 2014). With economies of scale the builder would be able to reduce that cost by some margin, if the panels were fitted as the roof was being built. The new houses being completed where I live are in the £300,000-£400,000 range. Some cost more. How could a few thousand pounds not be absorbed into that price? And even if it couldn’t, that small extra charge could be “sold” to the buyer with the promise of free energy to come. Whether owners export to the National Grid, or use it all themselves to reduce their own electricity costs, they’re making savings. Many of these houses are being bought by youngish families, who are likely to stay around for 7 to 10 years and more, as their children progress through local schools. So even if the panels do add to the house cost, they will have their money back in a short time even with steadily reducing feed-in tariffs. So what are the arguments against? Maintenance? But solar panels are more or less self-cleaning – and the rain around here will finish the job. New houses are built at all sorts of different angles, and some roofs will catch less sun than others. But buyers will still have an even chance of their roof facing between sun-catching due east and due west. Besides, any free energy from those ample steep roofs is better than none at all. Solar panels spoil the look of the house? As if the average new house had an aesthetic appeal that was capable of being damaged. One MP took up this call in 2012. John Stevenson, who represents Carlisle, called on the government to make solar panels compulsory on all new homes. The government did not oblige. Some of the best estimates of the cost of fitting new homes for energy efficiency comes from the Zero Carbon Hub, a public-private partnership which has published a cost analysis by Sweett Group. The Hub estimate that bringing a semi-detached house up to its Zero Carbon Standard from today’s building standards would cost £4,100-£4,700 extra, with flats costing just £2,200-£2,400 extra. With energy bills very unlikely to remain static, the time taken to recover this investment at the construction stage is likely to be considerably less than 10 years. A nation that can accept a smoking ban, a charge for plastic bags, and a fox hunting ban would, I believe, welcome a solar panels ordinance without protest. My hunch, when the figures show a majority of the public believe climate change is dangerous and that it is man-made, is that they would welcome it. Only the builders would demur – although by no means all of them. It’s depressingly easy to imagine the suits around a polished table at a big builder board meeting grumbling at a few extra noughts on the balance sheet. The volume builders are fundamentally cautious, and will only do things if they are forced to. This isn’t to say they don’t care about the environment. The top 10 house builders pay to be publicly scored and ranked on their environmental policies and performance. As for the government, it is well on its way to meeting its (modest) carbon reduction goals for 2017 (Committee on Climate Change, in its annual progress report, June 2013). That’s a short-term-target box ticked. No need, it would seem, to talk about possible price increases that might threaten its chances in the next-election. Whatever the reason, I think it’s a big missed opportunity to galvanise the industry and make solar energy mainstream. In 2013, in the city of Lancaster, California, the City Council unanimously approved changes to city regulations, requiring housing developers to install solar with every new home they build. Granted California is a hotter, sunnier and drier climate then rainy old Britain, but it seems that man, and that city have a vision. Referring to “the life-extinguishing possibility” of climate change, Parris praised his council’s courage. “These are people who want a future in Republican politics,” he said, “yet, knowing this may not be the right thing in the short term, they did what they believe is the right thing for the future.